My close personal relationship with my desk, keyboard and computer screens continued today, finding me pretty much locked in my desk chair and focused on the tasks at hand. So, I was thoroughly delighted to be able to turn off the desk lamp for even a brief bit of time today as the sunshine streamed through the windows and brightened the room around me with dazzling winter sunlight. Glorious, lovely, bright sunshine. If you look closely at the photo, you can see my transition lenses darkened a bit. Yes, it was just that bright. We may have only had a brief window during which there was no need for any additional light. But, I’ll gladly take it. A month ago, it was ‘dark’ (think very, very grey) all day and completely dark by about 3.00-3.30 in the afternoon. Here we are heading into February and the days are longer and, more importantly, brighter. 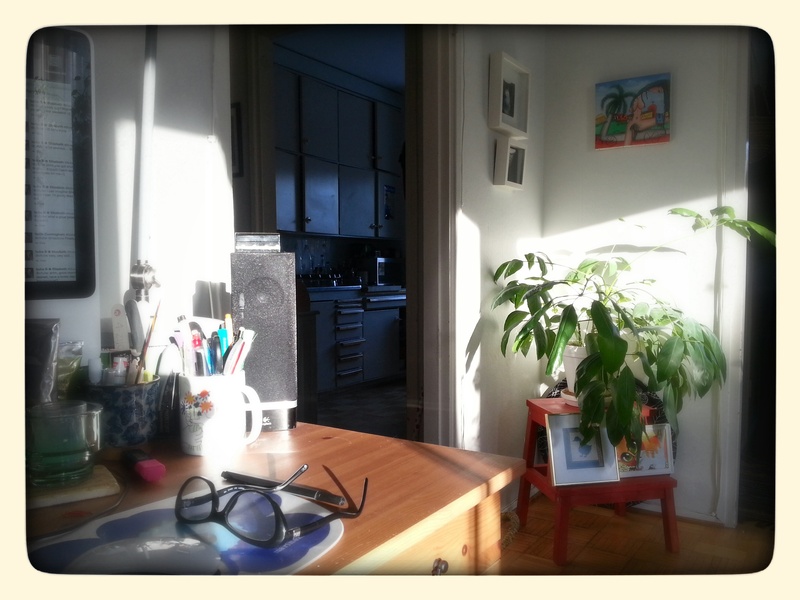 I swear, that plant in the corner along with all the other plants in our flat perked up as soon as the first traces of sunshine hit. That same plant looks rather sad just now, sitting in the darkness. We may be expecting a bit of snow over the weekend, which will be very much welcomed by this household. But, it is such a relief to see the days lengthen and the sun rise that much higher in the sky each day. Winter may be here, but summer is coming.